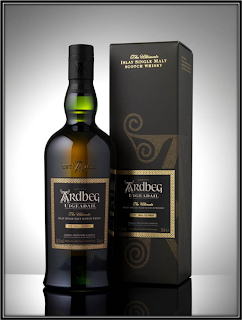 Nose: Young and Edgy with Grain Alcohol, Nut Shells, Brown Sugar, Salt, Oak, Heather, Malt, Green Apple, Dried Fruit, light Vanilla, Caramel and light Peat Smoke. It reminds me of JW Red although the Adventurer is slightly less Edgy. Taste: Thin and Watery but again not quite as rough as JW Red. 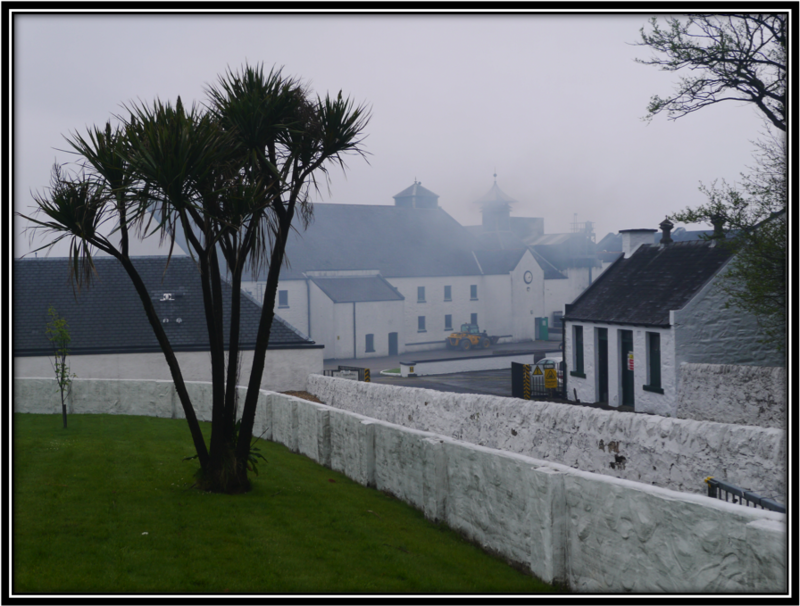 The Peat Smoke is more present here. I also find Grain Alcohol, Salted Nuts, Sugared Breakfast Cereals, Oak, Orange Zest, Toffee, Caramel, Resin, light Licorice and Pepper. Finish: Short and Edgy with Grain Alcohol, Sugared Breakfast Cereals, Toffee, Caramel, light Peat Smoke, slightly Bitter Orange Zest, Oak, Salted Almonds, Pepper, Cinnamon and Menthol. The Adventurer does not accept added Water. If you like, add a little Ice. 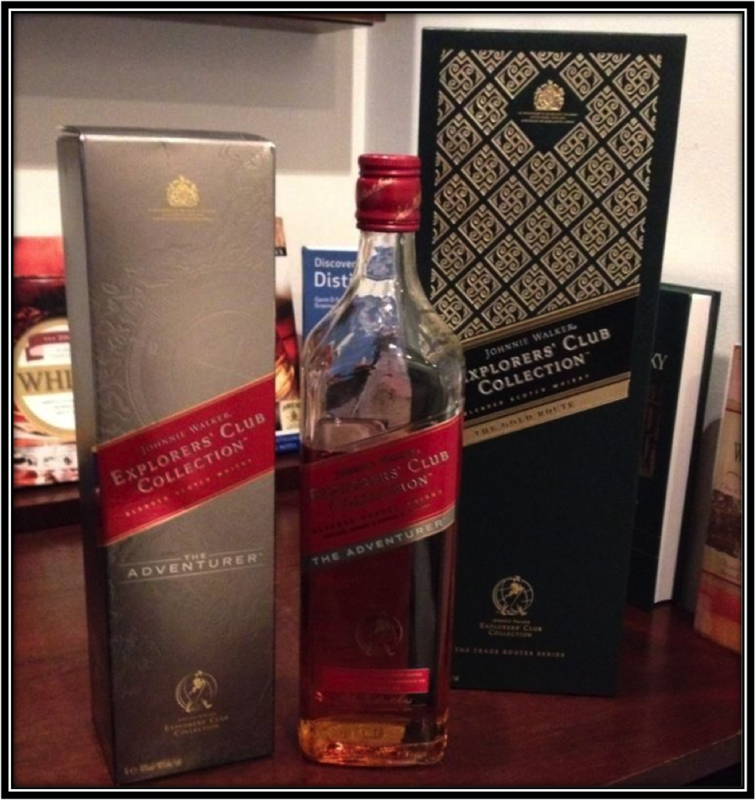 General Remarks: The Johnnie Walker Brand is owned since 1997 by the Diageo Group. 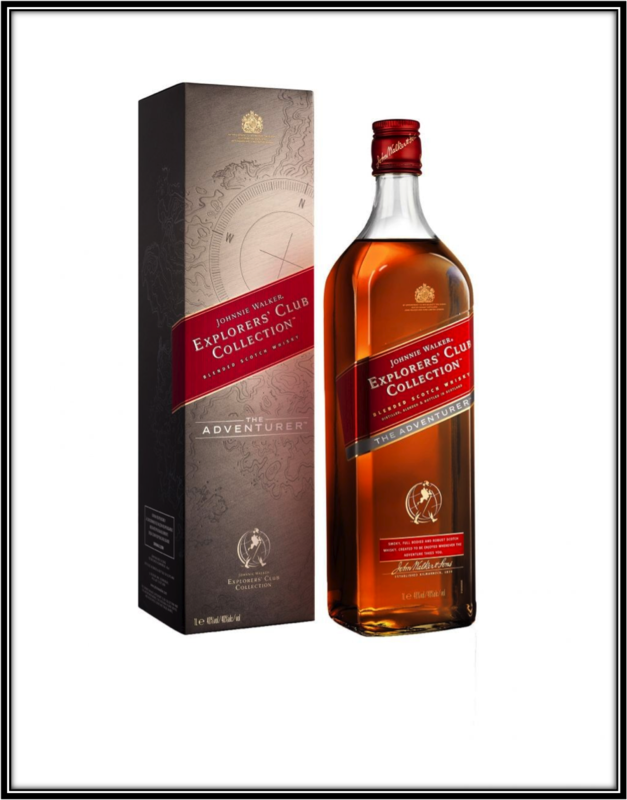 The Explorer's Club Collection is exclusively sold via Travel Retail and was introduced during 2012 and 2013 to honour the Johnnie Walker Whisky Traders who have always travelled the whole wide world in search of new adventures, experiences, flavours and aromas. The Trade Routes series include The Spice Road, The Gold Route and The Royal Route. Diageo's Master Blenders have tried to create Blends that reflect those voyages, stories and regions. It is likely that The Adventurer was the first of a new series within The Explorer's Club Collection. However a law suite was launched by the existing real life Explorer's Club that included such legendary names as Buzz Aldrin and Sir Ernest Shackleton. The Club funds scientific Research and Education and did not want their name used for commercial purposes without their permission. A judge ruled in favour of the Club in August 2014 which forged Diageo to rethink their strategy with regards to the Explorer's Club Collection. As a result, the Adventurer has become almost a rarity and a collectors item despite its humble ambitions. If you can find it in Travel Retail shops somewhere it would most likely cost you between 25 and 40 US Dollars. Conclusion: I wonder why Diageo launched this new JW Expression, be it that it might need to be continued under a different name on account of the law suite. That's probably just as good as the Adventurer does not bring any Adventure whatsoever. 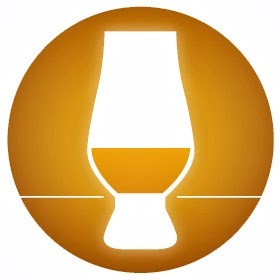 It's just a plain Vanilla (or better, plain Caramel) Blended Scotch Whisky that has nothing exciting to offer. It's a slightly refined version of the JW Red at a higher price in my opinion. And that would be in line with the company policy of the last years whereby good Blends like the original Black, Gold and Green are replaced by Double Black, Gold Reserve, Platinum and the Explorer's Club expressions. These new Blends are carefully promoted and packaging and design are really great and aimed at a (mostly) younger public. But in my opinion all this can't hide the fact that these new Blends do not have the same quality as the original expressions and they are marketed at much higher price levels. With enough commercial margins to, at least, increase the ABV to 43% and cut back on the Caramel colouring. And perhaps stop the Chill-Filtering of the most expensive expressions. That way at least the consumer would get something in return as well. The way it is I won't spend my money on Blends like The Adventurer. Or whatever it's name will be in the future! You are correct! Red Label in disguise. Really not much difference between the Adventurer and Red. Both are suitable for mix, not really great on their own. Hi Jason, thanks for commenting! I just read your review and I think we indeed agree on this one! Hope you are okay! Here everything is fine! I must admit I miss our regular conversations!! Thanks for commenting Doryll, glad you agree! Happy 2018! Cheers, Jan.